I've posted this on another forum but I thought I'd post it here since. 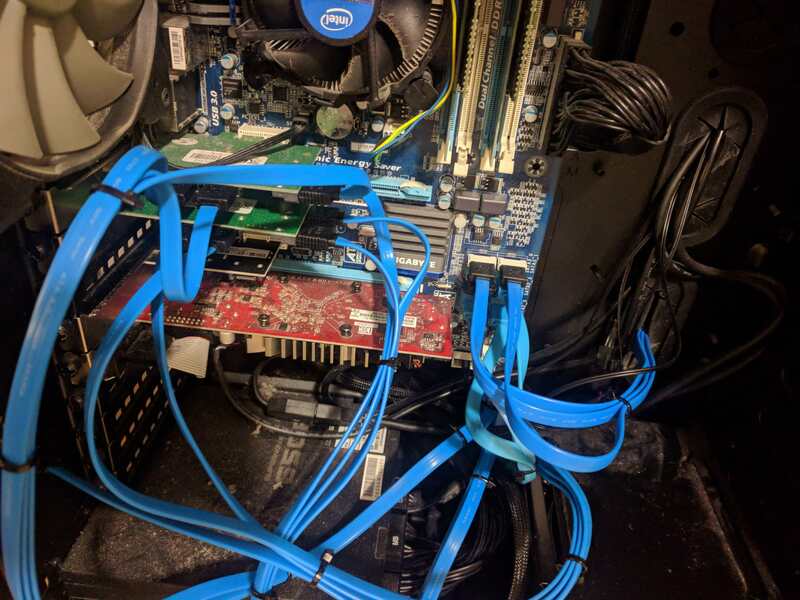 This server has been growing since I first put it together and it's a mix of old hardware with a really nice case. Yes, no joke, old laptop RAM in adapters to save a few bucks. And finally in snap on holders that go over the back of the 3.5" drives, the OS SSD and mechanical drives that handle downloading and unraring and such for Usenet and Torrents. Nice I like it. How does your software handle downloading files then transferring them to the holding tank before transferring them to the storage pool for archiving? Did you write custom scripts for it? I'm using SABNZBD mostly and it all handles that on it's own, as it needs specific temporarily for where files are downloaded and then where they are unrared to. Having it be seperate drives just reduces how much you bog down a mechanical drive in doing so. Granted Transmission doesn't do this so well. It's fine with seperate FOLDERS on the same drive but once you put them on separate drives when it finishes a torrent and tries to move it from one drive to another it just discards the data, concludes that it has no data, starts downloading the data again and will sit in an indefinite loop like that. :/ So that 500GB drive is used basically only for SABNZBD. Granted it all being mechanical, if I move more data around I can bog the drives down But with how MUCH traffic can go through that drive I'll deal with that bottleneck rather than grind an SSD to dust. How hot does it get with all those drives? 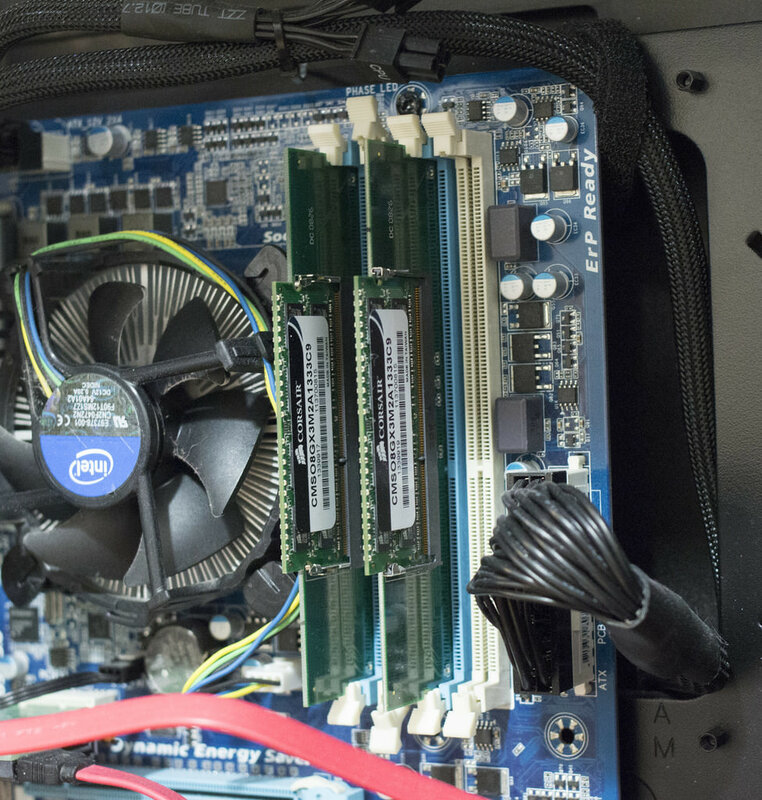 Looking at the first pic do you have fans installed on the right hand side of the case to blow air over them? Confusion is just a state of mind. It runs really cool actually. It has 2 fans in the front that blow over the drive cages but you can't see them, plust the rear fan. The power supply fan rarely runs so it has very little dust in it since the machine is so low powered. The i5 2300 is signifigantly undervolted to reduce heat and power consumption. Right now the CPU is idle at 27-31'C or so. The 3.5" drives range 28-38'C. The 2.5" drives are 23-29'C. The system spins down individual drives as per the power plan set in the Window's OS, FlexRAID only spins drives that it needs for reading a given file. So the system is fairly power efficent and cool. It idles at about 65 watts and peaks around 120-130w if all the drives are spinning and it has some load on the CPU. The 2300 itself might be overkill but it'll make it future proof for 10 years or so. Minor update made, one of the 4TB drives started offering errors so it was pulled and replaced with an 8TB drive. 62TB now! Though with a whopping 15TB still free it'll take a LONG time, like 1-2 years, to really need to expand storage again. I thought my 12 tb usable raid5 was cool. Sheesh. 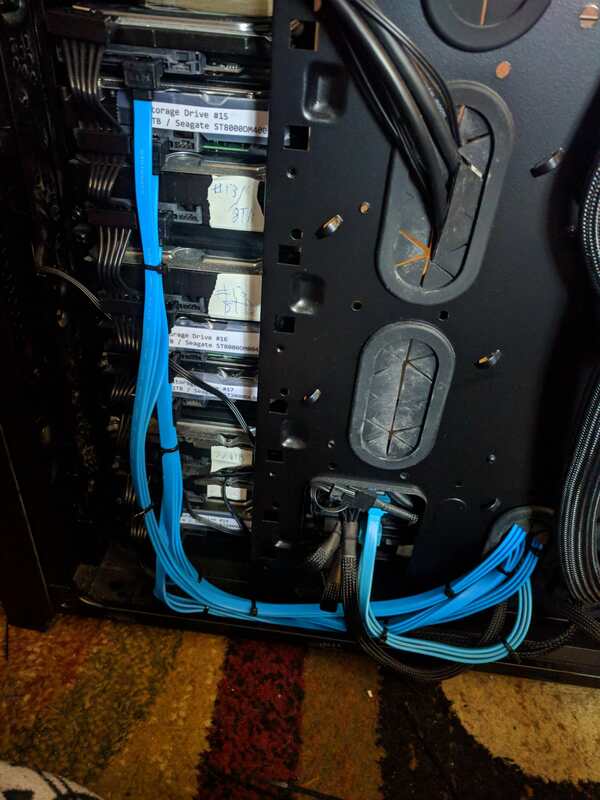 (2018-04-11, 08:19)natethomas Wrote: I thought my 12 tb usable raid5 was cool. Sheesh. There was a black friday sale on 8TBs for $179 CAD... Then again on Boxing Day... Then I replaced the 4TB with an 8TB but yeah at this point it's pretty overkill since FlexRAID allows me to expand on demand. I can just pop in another drive and the pool is larger in minutes. I'll spend more time physically moving the server and doing the installation than anything with software. So for a LONG time now I'll be coasting unless other drives fail. 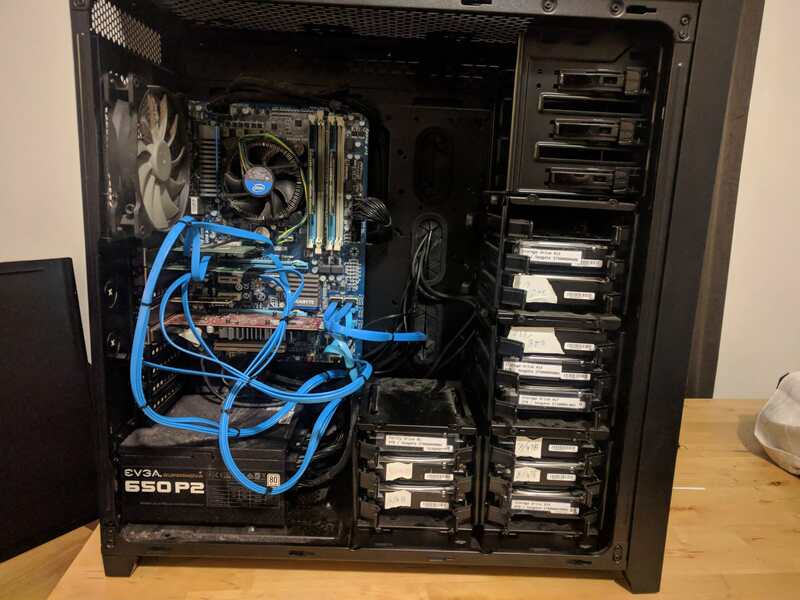 Have done something similar, but on a much less grand scale--quick question for you: What made you decide to go with FLEXRaid over native Windows Storage Spaces? (2018-04-18, 19:00)nchall Wrote: Have done something similar, but on a much less grand scale--quick question for you: What made you decide to go with FLEXRaid over native Windows Storage Spaces? Mostly it's ease of use. 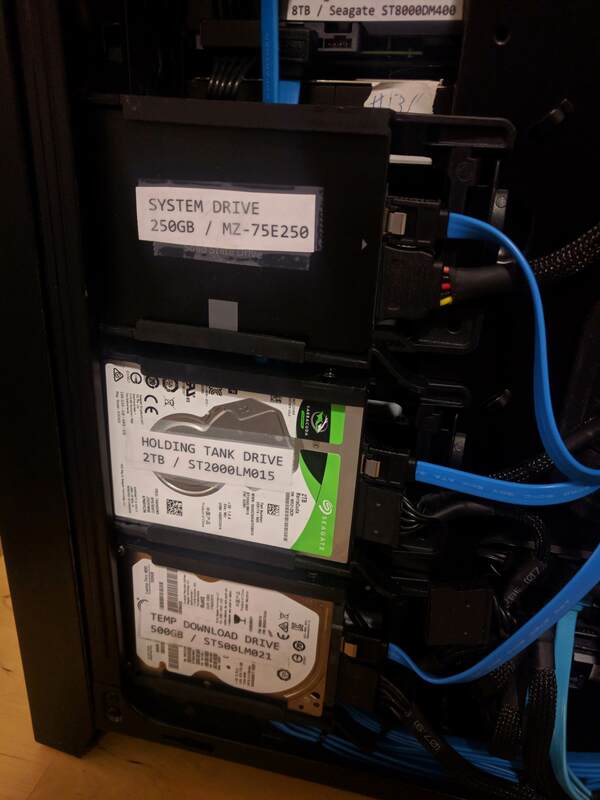 I can literally just jam in new drives of any size and FlexRAID can expand the parity to work. So the expansion is flexible and I can buy drives only as I need them. What if one day the internet disappears? People will line up at my door with their USB drives and I'll be a hero for having 1080p episodes of Goof Troop! ...Okay, maybe not. Sounds like me with the ghost and mrs muir! (2018-02-17, 17:43)DJ_Izumi Wrote: Yes, no joke, old laptop RAM in adapters to save a few bucks. I don't blame you at all with the current DIMM/SoDiMM prices.